The patented BFM fitting flexible connector fitting’s no-tool, snap-fit installation already makes it a safer option than traditional hose-clip type connectors, eliminating the risk of injury to workers by slipping screwdrivers during installation and changeovers. But, as with any flexible connection in a live production system, if the connector is removed at any time, there is still a potential risk hands can be placed near dangerous moving parts, such as rotary valves and knives. Now, a recent BFM innovation will further enhance safety for workers when dealing with connector removal in these types of positions. The BFM pneumatic monitoring system pumps pressurized air between the silicone cuff of the BFM connector and the spigot it sits inside. An air-line sensor immediately detects if this outward pressure is released as the connector cuff starts to be removed, setting off an alarm and/or shutting off any moving parts below. “This system has been developed to give peace of mind to customers who need an added level of security for their workers,” said BFM CEO, Blair McPheat. “We’re providing the system as a package and it can easily be retrofitted to most existing BFM fitting installations. “The standard option is waterproof and dustproof (to IP65 level), and we’re also providing an ATEX-compliant version to ensure that the system can be installed in plants with high-spec compliance requirements,” said McPheat. 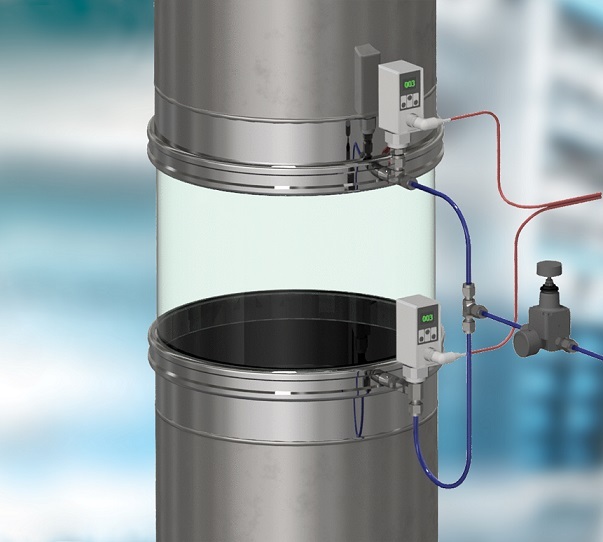 The system has a tamper-proof gauge and it can also be used as a positional sensor to ensure all connectors in a large plant are installed correctly at all times.